OMG! Australian Media Reform - The sky is falling in, Freedom of the Press is being attacked, The Government is trying to ‘Gag’ the media, “Growing anger at 'Soviet' media reforms”, “Gillard’s Henchman Attacks Our Freedom” (Great Mao photoshop on that one), I could carry on, though my personal favourite "Press tsar to check standards" from The Australian, our supposedly pre-eminent National paper. Hell, even blind freddy can see the theme here? Yes, that is right, I know if you read the papers you might have missed this very salient point, BUT, these reforms are actually supposed to help us, the customer, voter, citizen, basically, the distracted masses outside of the seats of power, who actually rely on the media to inform us. The vast majority of the public still get their information from the mainstream media , not Social Media as Malcolm Turnbull maintains. He also maintains that the public can “discern where truth lies”, I would suggest that no they cannot. Of course, given full information from the media, yes they could, though when it is the media themselves deciding what they will or will not tell the Australian public, we poor punters have no idea what the truth is at all or just one media owners version of the truth? The sad state of the likes of "Meet The Press" is a perfect example. There are no variety of Press in this popular TV program, the re-vamped version is now produced by News Ltd, using News Ltd resources & staff, the title is perilously close to false advertising, you are not meeting the 'Press', you are meeting the News Ltd press. Again, the great unwashed don't know this, they think they are watching a 'News Analysis' program, unaware of the commercial interest. Anyone else see an issue with this? The great unwashed are in general, blissfully unaware of the fact we really do not have any diversity of media in this country. Looking at Queensland alone, punters are amazed when they find out that ONE company owns or has an interest in The Australian (our major National paper), The Courier Mail (only state-wide paper), Foxtel (popular in regional Qld due to poor TV reception), even the NRL does not escape the News Ltd clutches. How can any one person with even the smallest does of common-sense think that ONE person owning that much power to influence the public be a good thing? There is a reason that the charming Mr John Birmingham refers to this company as "News Ltd Death Star", the pop culture reference is extremely apt. Would we think that having one company supplying about 75% of our food to the nation as a good thing? Basically News Ltd rules our media, there is Fairfax of course, though once you get past those 2 big boys, there is really very little diversity left at all. The average person on the street is already cranky about the Coles Woolworths duopoly, so why the hell do the media think that only having 2 main players in the print media sector is ok and not being abused? Diversity is important and we don’t have enough of it. Malcolm Turnbull seems to think that if a paper is doing a bad job, it is an “issue between the paper and it’s readers”. Trying to make a complaint as a punter to a major paper is bloody hard work. I am still waiting for the ABC to get back to me in regard to a complaint made in January? If you actually do bother to go to the “Press Council”, that is even more onerous, though obviously business & other media organisations seem to love the Press Council, the punter, MEH! Pretty irrelevant. Now, in any other sector of society, there is an Ombudsman or the likes of Fair Trading, that 'Jill Dill' can phone or write to and make a complaint or get some sort of re-dress. Not the media, they regulate themselves, again, something the bloke walking around in the street is not aware of. If every other industry has some form of Government over-sight that protects members of the public why the hell should media not as well? A Public Interest Media Advocate should not be a threat to the media if they are actually doing ‘the right thing by the Australian Public’? The hysterical terminology used in all these articles this morning (and I have only picked out a choice few...) that are solidly aimed at ‘scaring’ the punter, insinuating that the ‘Government is trying to take control of the News to abuse it’ actually PROVES the need for Media Reform. I don’t blame the Journalists themselves, they take their lead from their bosses. Their bosses are not interested in democracy, they are interested in their share price and profits, not any high faluting concept of ‘freedom of speech’ they are shouting about now, that is just cynical BS. BUT, the punter doesn’t know all this, even a high school student knows that using a ‘scary’ headline accompanied by a ‘scary’ photo will paint a picture and sets the tone for ‘story’. This is what we have seen this morning and judging by comments being read out on ABC Breakfast this morning, they the predominantly News Ltd media have sadly been successful in scaring the Australian public. From a punters point of view, a read of the newspapers this morning shows that YES Freedom of the Press is at threat, though not from the Government, but from the dictatorial Media owners themselves sadly. Then again, what would I know, I am just the target market who keeps these media organisations afloat and who the reporters are supposedly informing? NOTE: Have a gander at "Conroy's media regulation proposals fail the public interest test", in the Australian (A News Ltd publication). This opinion piece is not even written by one of their own Journalists, it has been outsourced to James Paterson who is editor of the IPA Review at the Institute of Public Affairs. Grand sounding name isn't that, Institute of Public Affairs? Impressed? Check out their website,http://www.ipa.org.au/ look at the book they are flogging on the front page, read further on what they want. 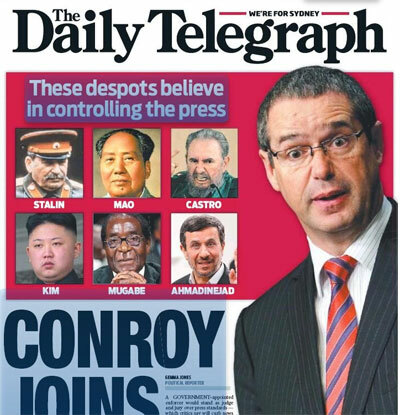 Now, the insidious nature of this group spreading it's paid for opinion through-out our media (The Australian, The Drum, The Project, just to name a few) is way more of a threat to our democracy then Mr Conroy wanting to reign in the media & make them a tad more accountable, in my opinion.